The name lemon myrtle is also ap­plied to a loosely related species, Lepto­spermum citratum (Lemon tea tree) from Australia and New Zealand. Intensive, refreshing and very, very lemon-like; the odour has been described, without undue exaggeration, as more lemon than lemon . Taste is similar, very intensive, pleasant and warm. 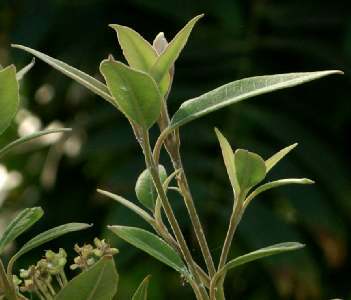 The leaves contain much essential oil (typically, 4 to 5%), which is made up almost totally of terpenoid aldehydes: citral (90 to 95%), neral and geranial. Trace constituents are myrcene, linalool, citronellal, cyclocitral and methyl-heptenone. The plant is native to Australia; it is a rare plant, restricted to Queens­land, and con­sidered en­dan­gered. It is culti­vated since the early 90’ies. 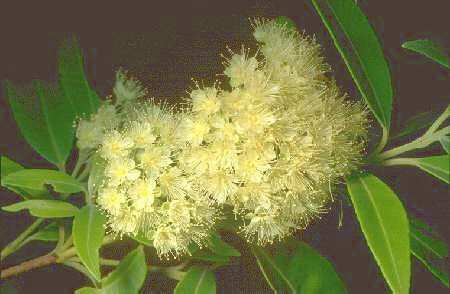 Two close relatives of lemon myrtle are also grown to produce essential oils: anise myrtle (Backhousia anisata) and cinnamon myrtle (Backhousia myrtifolia). The genus Backhousia is named after a British botanist, James Backhouse (1794 – 1869). The species name, citriodorus lemon-scented , is a neo-Latin formation (citrus and odor scent, smell ). Lemon myrtle features the most refreshing, pure and intensive lemon odour of all spices known to me — including lemon. It’s no surprise that Australia sees it as an important crop for the future. Australian cuisine is young and evolving rapidly; native Australian spices play an important rôle in defining a kind of national character (see also Tasmanian pepper). 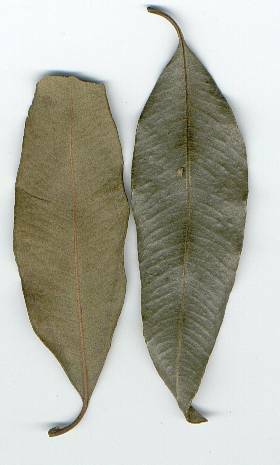 Lemon myrtle leaves are often used to flavour poultry or sea food: Just one or two leaves give a special touch to roasted chicken. Furthermore, lemon myrtle is popular for herbed vinegar (see dill), mayonnaise (see also tarragon) and vinaigrettes. 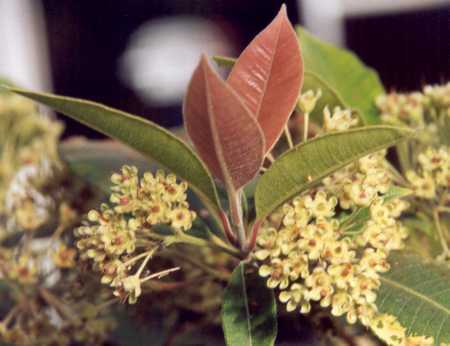 Australian cooks tend to use lemon myrtle leaves instead of kaffir lime leaves in recipes of South-East Asian origin; yet lemon myrtle’s very pure scent does not go so well with the pungent fish pastes and fish sauces of Thailand. Fragrance of lemon or citrus type is quite common in the plant king­dom and found many dif­ferent taxa not related at all. Besides lemon and its relatives (citron, lime, kaffir lime), lemon verbena, lemon balm, lemon grass and of course lemon myrtle have the purest lemon scent; lemon grass is distinguished by a most lovely hint of rose flowers. The essential oils of all these plants contain large fractions of terpenoid aldehydes. Other plants, though citrus-like, cannot be said to mimic lemon fragrance; their essential oils are often dominated by terpene hydrocarbons. An example is ginger; sassafras, though weak, also belongs in this group. The strong-smelling Mexican herb epazote awakes rather different associations ranging from skunk sweat to lemon fragrance; southernwood is a very similar case. Some chemotypes of the chameleon plant display a strong aroma reminiscent to both lemon and orange. Another Vietnamese culinary herb, rice paddy herb, is characterized by a most unusual, tickling lemon flavour. Lastly, lemon-scented varieties, relatives or cultivars of many common herbs are known; examples include, but are not restricted to, basil, thyme, savory, perilla and eucalypt.